If you are suffering from significant dental decay or damage, Dr. Susana Moncada in Orlando FL, can provide you with a dental crown, inlay, or onlay to restore form and functionality. Using the advanced CEREC solution, our team create and place your restoration in a single visit, eliminating your need for temporary restorations and reducing your time spent in the dentist's chair. At Windermere Dental Group, we are proud to provide our patients with convenient and precise dental procedures to to achieve optimal oral health and a beautiful smile. During your initial consultation, Dr. Moncada will conduct a thorough examination to determine whether you are a candidate for CEREC restorations. If you decide to move forward, Dr. Moncada will prepare your tooth for your restoration. Depending upon your needs, this may involve removing any decayed or damaged tissue from your teeth and gums or reshaping your tooth by removing enamel. Your dentist will then take a 3-D image of your smile using advanced CAD/CAM (computer-aided design and computer-aided manufacturing) technology. Using this data, the CEREC milling unit can create a precise and accurate restoration that will fit comfortably in your mouth and match the appearance of your smile. Before securing the restoration in place, Dr. Moncada will check the fit of your dental crown, inlay, or onlay against your tooth surface. She can make any necessary revisions immediately to minimize your waiting time. Your dentist will then bond your new restoration to your tooth and polish it to reveal your new, enhanced smile. At Windermere Dental Group, we are proud to provide our patients with convenient and precise dental procedures to to achieve optimal oral health and a beautiful smile. This convenient solution to restorations saves you time and in many cases, money. 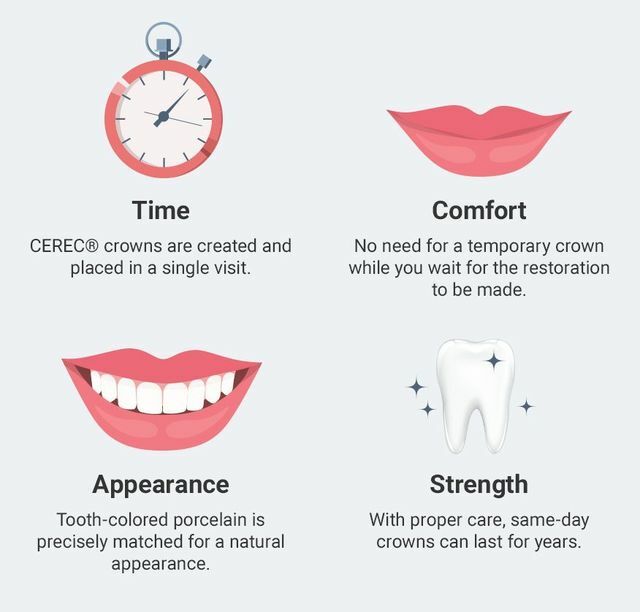 The CEREC machine eliminates the need for multiple visits to the dentist, temporary crowns, and external lab fees, which typically reduces your overall treatment cost. In addition, the CEREC machine can create incredibly precise restorations that reflect the shape and structure of your natural tooth. This allows you to maintain a comfortable bite, so that you can chew and speak properly. Using this technology, we also offer a variety of strong and beautiful restoration materials including traditional options like porcelain and zirconia and also the newest materials like IPS e.max and IPS Empress glass-ceramic. During your appointment, Dr. Moncada can review these options with you in greater detail to help you choose the best material to meet your goals. Using the CEREC solution, Dr. Moncada can help patients achieve and maintain a healthy smile in a single visit. At Windermere Dental Group, we strive to provide our patients with optimal comfort during any dental procedure. When you choose our experienced team to perform your CEREC treatment, you can experience long-lasting results. In addition, you can enjoy our in-office amenities such as movies, television, and comfortable chairs to put you at ease. At our practice, we use the CEREC machine to create restorations for a variety of treatments, including root canal therapy. To find out if you are a candidate for this treatment, schedule your appointment with Dr. Moncada by calling (407) 294-1132 or filling out our online form.